GROVE, Okla. — Edwin Evers predicted he’d catch a bass from a flower pot, which was among a plethora of unusual structure recently inundated by Grand Lake’s rapidly rising waters. The Elite Series pro made good on his prediction Thursday, during the latest event in the OPTIMA Batteries Wounded In Action Healing Heroes tour. It wasn’t the only fish-catch that impressed Evers’ partner, Mark Broda, a WWIA senior associate from Avon, Ind. Evers, who lives in Talala, Okla., had a big edge in Grand Lake bass fishing experience over his and Broda’s opponents – Greg Mansfield of Olatha, Kan., and Joel Willert of Burnsville, Minn. But Evers thought Grand Lake’s 7-foot rise in 4 days had eliminated that edge. Mansfield and Willert offered more than token competition. They met through a mutual friend at at the Bassmaster Central Open on Mississippi’s Ross Barnett Reservoir in March. Mansfield fished all three divisions of the Opens Series a year ago and is competing in two this year. Willert and a partner recently won a big local tournament on the Mississippi River near Minneapolis. However, it was experience that won out Thursday – Evers’ years of it on the Elite Series circuit. The 40-year-old pro has earned over $2.2 million in B.A.S.S. 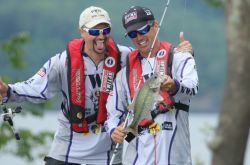 events and three times has finished as runner-up in the Toyota Angler of the Year competition. He has learned many lessons in adapting to changing conditions. Evers and Broda finished with a five-bass limit weighing 18.64 pounds; Mansfield and Willert caught three bass, including two 4-pounders, that totaled 10.26 pounds. Evers caught enough big bass during the 7 a.m. to 2 p.m. competition, which, of course, included an unscheduled break for an 11 a.m. thunderstorm, to cull Broda’s bass from the livewell. While the flower pot did produce one good keeper, Evers’ main pattern was flipping a Zoom Brush Hog or a Zoom Super Hog on a ½-ounce weight to isolated trees – trees that would normally be well out of the water. “We were fishing in people’s yards,” Evers said. During the course of the day, several lakefront homeowners watched from their front porches and occasionally engaged Evers in conversation from a short distance away. The anglers also had one boat of interested observers throughout the day. Brothers Steve and Randy Baskins, now retired, live in Owasso, Okla., and have a home on the lake. They fish local bass tournaments, take regular trips to bass fishing hot spots in the U.S. and Mexico and follow the Bassmaster Elite Series with great interest. Just before the storm hit Grand Lake, they created some thunder of their own. In a brief boat-to-boat conversation, they told Broda of a plan to donate $100 to the WWIA Foundation for every pound the two teams totaled at the weigh-in. Broda was, well, shocked and awed. “That was completely unexpected and an incredibly generous offer,” Broda said. At the end of the day, the Baskins brothers essentially doubled the money raised by this event, as the two teams finished with a combined 28.90 pounds. Mansfield and his company, City Wide Services of Minnesota, bid $2,800 to earn the chance to fish against Evers and Broda. Those funds will go directly to the Wounded Warriors In Action Foundation. This was a special trip for Broda. He has been involved with the WWIA program for several years now, working as an associate to accompany other Purple Heart recipients on outdoors adventures. Within the last two weeks, he accompanied a group on a marlin fishing trip off the coast of Mexico. But in that role, he just helped other veterans rather than take a turn in the fish-fighting chair. Thursday, Broda got to catch some fish and receive valuable coaching from one of the best on the Bassmaster Elite Series. Like every one of the Purple Heart recipients that Evers has fished with in the previous events this year, Broda has quite a story. He’s probably of the few Air Force parachute-packing specialists to earn a Purple Heart for wounds suffered in action. Broda was in the final weeks of his service on June 25, 1996, when he was blasted across his room in Saudi Arabia’s Khobar Towers. A terrorist truck bomb exploded and sheered one side of the multi-floor building, where many U.S. military personnel were housed. The explosion resulted in 20 deaths and 372 non-fatal injuries. Broda, 42, is married to Kate O’Brien (“A good Irish girl who wanted to keep her last name in tribute to her heritage,” he said). They have a 10-year-old son, Cullen. Broda now works as an information technology specialist at Veteran’s Hospital near the Indianapolis suburb where he lives. There were two main questions yet to be answered at the conclusion of Thursday’s weigh-in: 1) When will it ever stop raining in Oklahoma, Texas and Arkansas? And, 2) How was Mark Broda going to safely transport the 3 ½-foot championship trophy on his flight home to Indiana?